All the driveway gate posts featured on this page are available from stock with delivery in 2-5 working days. Our gate posts for driveway gates come in three different cross-section sizes dependant on the size of gate leaf you want to install. 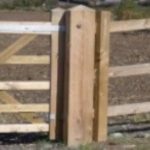 We stock and supply driveway gate posts in a number of different lengths as they are also commonly used with field gates . Sizes we carry year round are : 1.8m (6ft), 2.1m (7ft), 2.4m (8ft), 2.7m (9ft) and 3.0m (10ft). These posts are ideal for smaller driveway gates suitable for leafs up to 4ft wide. Allow 2ft in the ground and the height of the gate when ordering. These are ideal for driveway gate leafs up to 6ft wide by 6ft high. 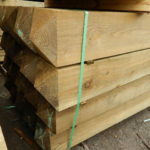 We stock these posts in a range of lengths including : 2.1m (7ft) and 2.4m (8ft). The largest gate posts we stock, these posts are suitable for the biggest and heaviest gates on the market. We offer these posts in 2.1m and 2.4m lengths. All the gate posts featured are offered with a weathered top. The posts are sawn tanalised timber . The preservative gives protection against fungus and insect damage-preventing rot for at least 15 years. The timber is from renewable, managed forests. If you need help selecting the correct size post for your gates call us on 024 76 588 909 and we can advise the correct type of fittings and posts you will require.